As 2019 nears, Argonne looks back at nine cool stories about discoveries in basic science and collaborations at the laboratory. 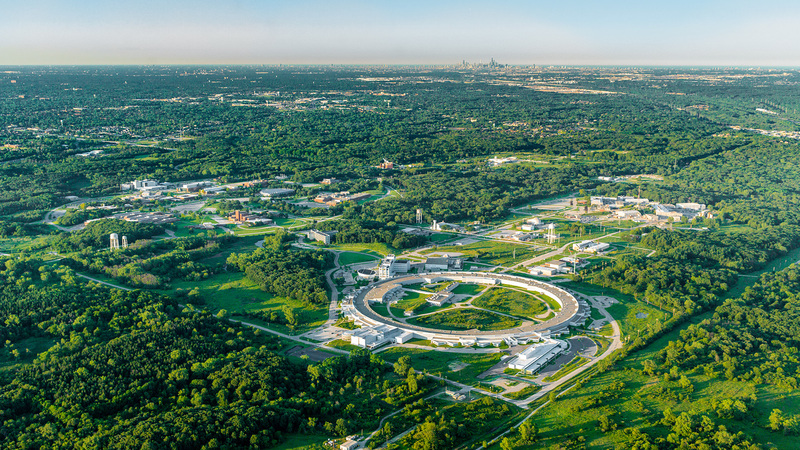 Scientists and engineers conduct groundbreaking research every day at the U.S. Department of Energy’s (DOE) Argonne National Laboratory. They explore a wide range of disciplines, helping to answer fundamental questions about our world and addressing our nation’s energy and security challenges. In 2018, the laboratory made major contributions to fields ranging from battery science to high-energy physics. Scientists from Argonne and the University of Illinois at Chicago produced a lithium-air battery that maintains high performance for 700 charge and discharge cycles, far surpassing previous technology. The new battery design features a protective coating and a novel electrolyte mixture that allows the cell to operate in a normal air environment, eliminating the usual need for cumbersome tanks of pure oxygen. The battery, which could eventually be used to power electric cars, stores three times more energy than regular lithium-ion batteries. Over 40 years ago, physicists predicted that an electron captured by an atom could excite the atom’s nucleus to a higher energy state. This year, scientists from Argonne and the Army Research Laboratory performed an experiment that demonstrated this effect using the Argonne Tandem Linear Accelerator (ATLAS) and Gammasphere, a powerful gamma ray spectrometer. The interaction releases energy that scientists and engineers could potentially harness as a power source, and studying the effect might improve scientists’ understanding of the lifecycles of stars. ReCell, a computer model developed at Argonne, gauges the impact of recycling batteries from electric vehicles. The model breaks down every part of the battery’s life — from when it leaves the factory to when it is recycled — to estimate its total cost and environmental impact. ReCell works for many types of batteries, and it considers everything from transportation costs to environmental factors, such as carbon dioxide emissions. Information provided by ReCell will become increasingly important as thousands of batteries from vehicles sold over the last decade begin to die. The model could also help steer the development of better recycling infrastructures. Researchers at Argonne used a combination of nanodiamonds and a chemical called molybdenum disulfide to create an extremely long-lasting dry lubricant with near-zero friction. A few drops can lubricate metal sliding for kilometers, and there is no dirty residue to clean up like there is with traditional lubricants. The substance can be used virtually wherever two pieces of metal rub together in dry conditions. In lithium-ion batteries, there is a thin chemical layer that forms between the liquid and solid parts of the battery material. This layer, called the solid-electrolyte interphase, has a large effect on battery performance, but scientists still lack information about its chemical makeup and role. A team of Argonne scientists recently studied this interphase and reported major discoveries about its formation that demonstrate the importance of catalysis in battery operation. The scientists are using this information to improve battery performance. The DOE selected Argonne to lead an Energy Frontier Research Center focused on advancing materials for energy-water systems. The program, to which the DOE provided $100 million in funding, brings together researchers from national laboratories, universities and nonprofit organizations to gain a deeper understanding of the systems that handle, process and treat water, as well as the chemical reactions central to those systems. Argonne researchers recently examined the benefits of establishing habitats at solar energy facilities for pollinating insects, such as wild bees and monarch butterflies, to encourage population growth. Man-made stressors, such as pesticides and land development, are taking away pollinator habitats, causing species to decline rapidly and devastating crop production. Integrating native plant species and solar farms on the same stretches of land — land that otherwise goes unused — would rebuild pollinator habitats and make solar farms a more welcome neighbor to agricultural farms. Read more: Can solar energy save the bees? The United States recently reinvigorated its hypersonics program with the goal of achieving speeds of Mach 5 — or five times the speed of sound — in aircraft and weaponry. Using the powerful X-rays at APS, Argonne physicist Alan Kastengren is obtaining a more accurate picture of the dynamics occurring within the jets of hypersonic aircraft. Rather than carry bulky oxygen tanks like traditional aircraft, hypersonic vehicles pull oxygen from the atmosphere in order to reach such high speeds. This makes it challenging to obtain optimal fuel-air mixtures for combustion, and it complicates the flow of fuel throughout the aircraft. The insights provided by Kastengren’s work will help developers to test computer models of the flow and mixtures of fuel in the jets, leading to improved performance. Battery researchers at Argonne have discovered an important chemical reaction that resembles the method used to make pickles. The reaction provides key insights into the behavior of a common electrolyte additive that boosts the performance of lithium-ion batteries used in electric vehicles. In their research, the scientists demonstrated that this ​“pickling” offers several benefits to the battery, including decreased resistance and degradation prevention. The ALCF, APS, and ATLAS are DOE Office of Science User Facilities. Dr. Daniel Abraham is a leading scientist in the field of lithium-ion batteries. At Argonne, he leads the effort to identify performance degradation mechanisms in lithium-ion cells.